We’ve hit the big time – the Los Angeles Times Writes up Aptos! It seems that a travel writer visited Aptos recently, and wrote a story for the Los Angeles Times entitled Slowing down to savor the good life in Aptos, Calif. The writer, Michele Bigley, has written a number of travel guides and writes hotel reviews for Fodor’s California and Fodor’s San Francisco. Everything in Aptos closes early, so slowing down is simple. Late at night, we sat on the deck sharing a bottle of local vino and wishing we too could live the slow life. Here’s to living the slow life, Aptos! Marianne’s Ice Cream is a Santa Cruz institution, having been a family run business with a single location for over 50 years. In 2014, Marianne’s had the good taste to open their second location in Aptos, in the Seacliff neighborhood, just outside of Seacliff Beach. Marianne’s Ice Cream in Aptos is yet another welcome addition to the Aptos experience. Tip: They also offer coffee and espresso, and they’ll offer a variety of beach-type items also for sale. Great news ice cream lovers! 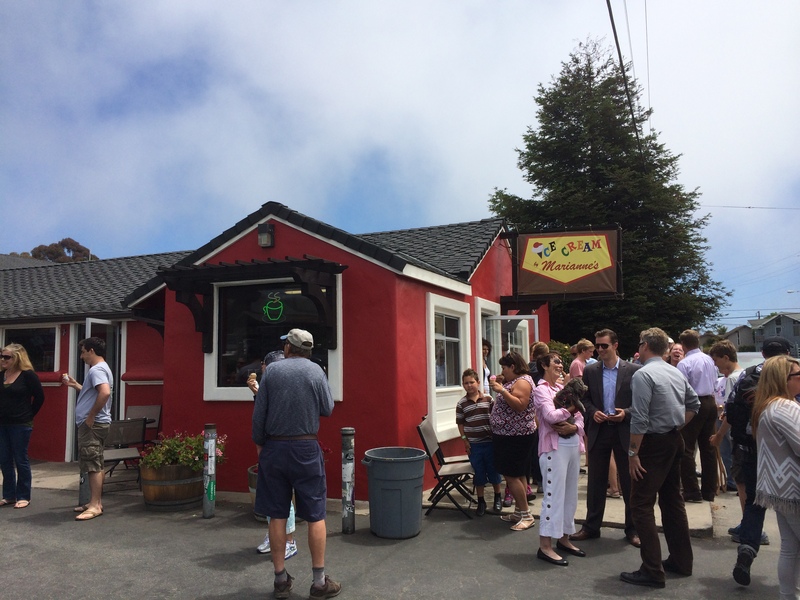 Marianne’s Ice Cream is opening its 2nd location…in Aptos! Marianne’s is legendary among local (and not-so-local) ice cream aficionados. It’s been in operation since 1958 at a single location on Ocean Street in Santa Cruz. And now, Marianne’s has the good taste to be opening a second location, after over half a century, in the Seacliff neighborhood of Aptos. The new Marianne’s location is going in at the corner of State Park Drive and Center Avenue, across from the Snow White Drive-In and Manuel’s Mexican Restaurant…and just down the street a ways from Pizza-1. And, of course, it is also located directly across from the entrance to Seacliff State Beach. The new operation should be up and running in the next couple of months, just in time for the warmer weather. Stay tuned!